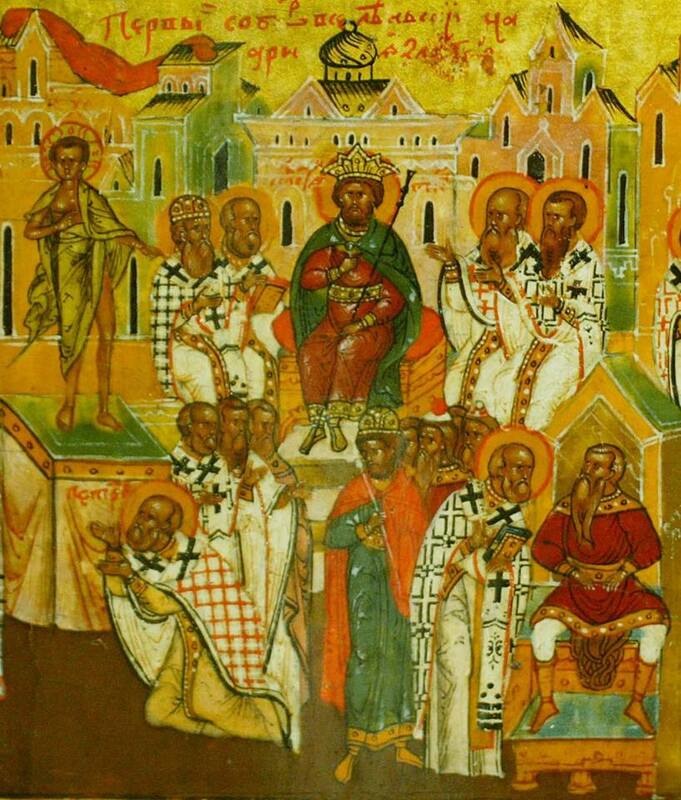 The Orthodox Church today prayerfully commemorates the Fathers of the First Ecumenical Council of Nicaea, which once gathered in the city of Nicaea to investigate and condemn the heresy of Arius. We know that in the first centuries of Christianity, the Church endured severe persecution, first from the Jews and then from the pagan Roman imperial power. 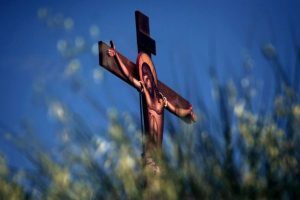 But despite the fact that this persecution was bloody, and despite the fact that thousands of Christians died under torture for their confession of faith, it was nonetheless not dangerous for the Church. The Christian of the first centuries remembered well that the Lord Jesus Christ had said: And fear not them which kill the body, but are not able to kill the soul: but rather fear him which is able to destroy both soul and body in hell (Matthew 10:28). And in the Apocalypse He says: be thou faithful unto death, and I will give thee a crown of life (Revelation 2:10). In these bloody persecutions, Christians were faithful unto death: they went to their death as martyrs and they received from the Lord Savior the crown of eternal life earned by them. When the era of persecution had ended, another began. This one was much more dangerous for the Church. Then heresy, delusion, and distortion of truth appeared within the Church. These had begun to appear immediately, but the first were not much noticed and did not attract many followers. But the heresy of Arius, which happened to appear when the persecution had ended, agitated the entire Church. Arius was a scholar and eloquent presbyter, that is, priest – a pastor in the city of Alexandria. The bishop of Alexandria died. At that time the flock choose its own pastors. They had to elect a new successor from among the presbyters. The eloquent and educated Arius, who held a prominent position, was certain that he would be chosen and become the bishop. But the majority of the clergy and people chose another bishop, the presbyter Alexander, who was just as well read, educated, and knowledgeable. He was not as outstanding and talented as Arius, but he was distinguished by his piety and was truly a man of righteous and holy life. For this reason he was honored by the clergy, who in turn elected him. This piqued Arius’ wounded self-love. Unfortunately, this is always the case in the history of heresies. In the beginning there is inevitably an evil motive, an evil impulse of personal character, which is wrapped in the garments of supposed fidelity to truth. Thus Arius, in his self-love, decided to speak out against his own bishop – he could not accept the fact that he was not the bishop. Once Bishop Alexander spoke with his clergy about the Mystery of the Holy Trinity, about the equality of its Persons: that the Holy Trinity is Unity in Trinity, inasmuch as there is One Divine Essence, One Divine Nature, in three Persons. Arius began boldly to contradict him, asserting that the Son of God is neither equal to God the Father, as Bishop Alexander had said, nor born of Him, but was rather created by Him, as a creature, a creation. Granted, higher and more perfect, but still a creation, a creature. Alexander tried with gentle admonitions to reason with Arius, but the latter persevered. Owing to his eloquence, this heresy arose and spread through his hard-handedness, eventually troubling the entire Church. Alexander, as bishop, excommunicated him from the Church. He left therefrom, but began to spread his doctrine further and further. In the end, the Equal-to-the-Apostles Emperor Constantine himself commissioned Hosius of Cordova, well known for his piety and deep wisdom, to make sense out of what kind of heresy this was. The aged Bishop Hosius, pious and wise, arrived in Alexandria. He investigated this question without any prejudice, with absolutely impartiality, and returned to tell the Emperor that Arius was preaching a terrible heresy that subverts all of Christianity. For if the Son of God is not equal to God the Father and is not born of Him, then He is not God, but creation, which means that He was not incarnate as the true God-Man. This means that the work of our salvation was not accomplished, as our Christian faith teaches us it was. In the end, an Ecumenical Council gathered. Arius had only a few bishops on his side. The overwhelming majority of bishops (more than 300 assembled for the Council) stood firmly for the Orthodox faith, condemned the heresy of Arius, and excommunicated him from the Church as a persistent and incorrigible heretic. This heretic died a horrible death, but his heresy continued to trouble the Church for a long time. Only gradually did it begin to subside. It still had to be fought against by Basil the Great, Gregory the Theologian, and John Chrysostom, who lived after Arius. But the truth ultimately triumphed, although there was a time when, of all Orthodox bishops, only St. Athanasius the Great remained in the East and only St. Hilary of Poitiers remained in the West. All the other episcopal cathedras – hundreds of them – were seized by bishops who were Arian heretics. The Church, however, did not perish. 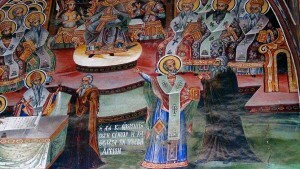 It was difficult for St. Athanasius to fight against the heretics in the East. He was exiled many times, but he remained unmoved. 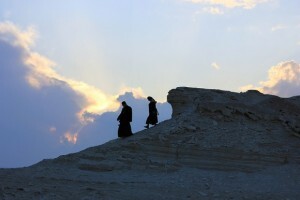 When, in his solitude, he learned that he finally had an ally and successor in the person of St. Basil the Great, he breathed a sigh of relief. Thus did the Church endure this heresy, and thus was it disturbed thereby. After Arius there were other heretics, who were likewise condemned by Ecumenical Councils. But today we remember the First Ecumenical Council, which condemned Arius and his heresy. Amen.